More and more American families own pets. A recent study says that 85 million families in the United States own a pet. The American Pet Products Association’s study for the years 2017-2018 says that represents 68 percent of all families in the U.S.
Thirty years ago, when the study was first done, 56 percent of families owned a pet. The survey found dogs are the most popular pets. Sixty-point-two percent of homes own one. Cats are the second most popular with 47.1 percent of families reporting they had a cat. Freshwater fish came in third with 12.5 percent. Nicki Dobson is head of marketing and communication for Three Dog Bakery. The business calls itself the "original bakery for dogs." 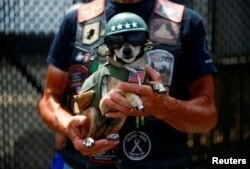 She said pets have become especially popular among Americans in the past 10 years. She said, "People are having more pets and less children. People are concerned about what they eat. Our whole premise was trying to make things with human-grade ingredients and a focus on nutrition. They look like human food, but they're meant for pets." Another company, Posh Puppy Boutique, sells clothes, jewelry and other items for dogs. 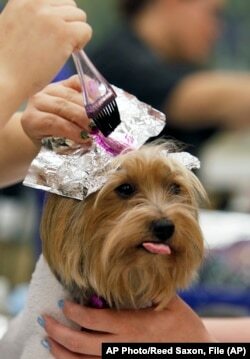 There are also pet hotels and pet health centers. One study found that Americans spend about $126 each month on their pets. Three Dog Bakery opened in 1989. Dobson says there are now 45 bakeries around the world, including in Canada and China. She said cakes are the most popular item. She added that some people pay $50-75 on baked goods each week for their pets. A man holds his dog, as participants gather in the parking lot of the Pentagon as thousands of military veterans and their supporters participate in the 31st annual Rolling Thunder motorcycle rally and Memorial Day weekend. Some younger Americans seem to be choosing pets over having children. Some are making big life decisions, such as buying a home, around the lives of their pets. The SunTrust banking company did a study in 2017 of people under the age of 40 buying their first home. The study found that 33 percent said a good yard or good space for their pets influenced them to buy a new home. Only 25 percent said marriage was a reason, and 19 percent said the birth of a child. Some companies now offer pet benefits such as pet insurance. They are also offering "pawternity" leave, which gives workers free time to spend with their new pets. Dobson noted that taking dogs to work is now popular in places that permit it. Americans' love for their pets is even influencing their travel plans. A recent survey found that 49 percent of pet owners have not left the country since owning their pet. Sixty-eight percent of those said it was because they feel guilty leaving their pets alone. Health experts say pets can improve the health of their owners. The American-based Centers for Disease Control and Prevention says pets can reduce blood pressure, cholesterol levels and feelings of loneliness. The CDC adds that pets also offer chances for outdoor exercise and socialization with other people. FILE - In this Oct. 26, 2011 photo, groomer Sara Ingram streaks the fur of Yorkshire terrier Betsey Johnson during a spa session at the Barkley Pet Hotel & Day Spa in Westlake Village, Calif.
Jonathan Evans adapted this story for Learning English based on VOA News report. Mario Ritter was the editor.